24.2.14 - A disappointing night against St Clare's, who belied their gradings with a strong performance. Well done to Jon for a calm conversion of a winning advantage which was not straightforward, finishing with 3 pawns against a knight. 21.2.14 - Press ganged into being Captain again while Mike was away on business I was fortunate that we were playing a friendly club from MCS/Blackbird Leys and in Dave Sayers a player I have known for over 40 years - frightening! Before start of play we were one player short as Peter did not travel because of the sad loss of his mother. Luckily Alan Gentry was on hand to step in on board 6. 14.2.14 - On Sunday 30th March 2014, Wellington College, one of the top co-educational day and boarding schools, will host a chess training day. These are aimed at a high level and have been very well received in the past. There will be 2 groups, one aimed at players graded over 150 (both adults and juniors) and one aimed at players graded from 100-150 (juniors only). Trainers in the past have included Grandmasters David Howell, Simon Williams and Nick Pert. Further information and entry details here. 13.2.14 - More reports have been posted, this time from recent Witney 2 and Witney 4 matches. 13.2.14 - Pavil went to the Classic and met some of his favourite players and also found time to play some chess! 12.2.14 - Our away match at Cowley took an untoward turn when Tim and Csaba failed to materialise at the appointed time and place. It appears that an unscheduled night time trip around of the scenic delights of Headington had taken place, culminating in a visit to the splendours of the Nuffield Orthopaedic Centre. 12.2.14 - If there can ever be an unconvincing 6:0 scoreline, this was it. Tim hung a rook at the end of his game; his opponent, instead of taking it, exuberantly played Rf8ch to clear a path for his queen to mate on g7. Unfortunately for him, Tim's reply Rxf8 was also check. Worse still, Tim's opponent then picked up his queen to deliver mate. 12.2.14 - A good solid win for Witney 4 to take us top (for now anyway) of Division 4. As usual I made the most of my time available (!) finally getting mate with at least a minute to spare, meaning I had little time to look at the other games. My opponent's English opening neglected defence of the King's side and allowed terminal pressure down the f-file. 12.2.14 - The latest results and games are now online following the completion of round 4. The 37th annual Kidlington Tournament held last weekend (our traditional slot on the first weekend in February), attracted a very satisfying 170 entrants, with 22 starters in the top section (U225), 46 in the U180, 59 in the U145 section, and 43 in the U120. This was considerably up on last year's total and the best for several years. A full list of prizewinners, the section crosstables, and a tournament report have now been posted on the tournament website: see the pages there under the '2014' tab. Congratulations go to Witney's 12-year-old Elizaveta Sheremetyeva, one member of a quartet of Oxfordshire juniors who formed a team wittingly named, 'Please Print Name Here', which shared the Team Tournament prize of £40 with (some might say) the very aptly named 'Cowley Knightmares'. My thanks go to all who helped to make the tournament a success: to the players who competed, to the controllers (this year Tim Dickinson, Alex Holowczak, and Lucy Smith), to Tom Williams (Tournament Treasurer and much more besides), to Andrew Butterworth of Chess Direct</a>, to Helen Hackett of Hackett's Food and Drink of Witney, to Brendan O'Gorman for posting photos of the event online, as well as to various other people acknowledged in the tournament report. The booking for next year for Exeter Hall, Kidlington, has now been confirmed, and the 38th annual Kidlington Chess Tournament will therefore take place there on Saturday and Sunday 7 & 8 February 2015. We hope to see you there! 22.1.14 - The latest results and games are now online following the completion of round 3. 22.1.14 - A rare report from Witney 3 as we reach the halfway point of the season. To date the team has made steady progress with some good and bad, particularly my performances. Although this 28th Junior Open Congress is organised by Wiltshire Junior Chess, it is open to ANY chess player aged under 18 on the 31st August 2013. 19.1.14 - My slow, long trail back to the game has started with some early Saturday Morning coaching with the Aylsham Chess Club Juniors. I did put my big right foot in it by a suggesting a move to a lad whose opponent instantly blubbed to his mum; apparently i've been forgiven! I did quite enjoy being in chess company; whether I will ever play again only time will tell! Regards to all at Witney CC who remember me. 19.1.14 - Witney 2's early hopes that Cowley 2 would need to work hard to achieve the 4:2 win required for them to advance to the semi-finals of the Frank Wood Shield were somewhat dampened by Mark Hannon's late withdrawal and by the news on arriving at the Cowley 2 venue that not only Gerard O'Reilly (ECF grade 190) but also Andy Walden (ECF grade 197) would be playing. Some small consolation was provided by Heather Lang's and Maria Lang's absence, but even so Witney 2 faced an uphill task. 16.1.14 - There's a nice article about October's Witney Weekend Congress in January 2014's CHESS magazine. 10.1.14 - The most recent league reports are now online for Witney 1, Witney 2 & Witney 4. The 37th Annual Kidlington Chess Tournament will be taking place on Saturday 1st & Sunday 2nd February at Exeter Hall, Oxford Road. The tournament has four sections (Under-120, Under-145, Under-180, and Under-225) of five rounds each. The total prize fund is £1930. There will be, as usual, a bookstall provided by Chess Direct, and refreshments will again be provided by Hackett's Food & Drink of Witney. Entry forms can be obtained online either from the tournament website or from the ECF Tournament Calendar. Hard copies of the entry forms are also being circulated to the secretaries of local clubs. Entries received by Saturday 11th January may deduct a £2 discount. The organising team hope that many local players will again support this well-established event and have an interesting and enjoyable weekend of competitive chess in pleasant surroundings. We look forward to seeing you there! 06.1.14 - The 2011 Cowley Christmas Blitz was held on Monday 2 December at Cowley Chess Club (at Rose Hill Methodist Church in the Main Hall downstairs). 2013 results and history about the Cowley Blitz..
23.11.13 - The first to finish was Bill Read with a fine win, followed by Maxim achieving a hard fought draw. Joshua won well, his first league win, and Freddie settled for a draw. 14.11.13 - The latest results and tables are now online following the completion of round 1. 09.11.13 - It wasn’t to be for Witney 4 against a very strong Cumnor 2 side, out-grading us on every board bar none. 09.11.13 - Witney 1 maintained their unbeaten start to the season and are already in the lead in Division 1 after only three matches. I was away on business so can't comment on the result in too much detail ... read more. 09.11.13 - Just a short message to let you all know about this weekend's Oxford Juniors tournament - qualifier for the LJCC (U12, U10, U8). It took place in MCS - a great venue as usual. Witney CC was very well presented and all the children did really well! Pavel won the U13 trophy and is going to have his name engraved alongside the Marcus Harvey's and a few other famous Oxfordshire players. Pavel finished second on 4½/6, only missing out by half a point to win outright. Ben won the controller's prize as after 15 minutes of thinking he went on to win a very difficult game. 09.11.13 - With it being half-term, Cumnor put out a weakened team. Eight year-old Leonora gave Paul a huge fright as she gained a hour time advantage and an overwhelming position ... read more. 31.10.13 - Detailed crosstables from the tournament are now available - with thanks to Gerard O'Reilly. 26.10.13 - Highlights: Oxford City have had their premises (partially) refurbished - new lights and new chairs. No new players unfortunately. And the playing conditions are as cramped as ever. Happily (well, unhappily in my case) Peter R and I finish early, which eases the congestion considerably. Read more. Here's a nice game played in the recent Witney 1 v Cowley 2 match on 14 Oct. Match details. 115 photos from the 1st Witney Congress - with thanks to Asen Asenov. This new event took place 19th & 20th October 2013 at Cokethorpe School, Witney. A list of prizewinners winners is now here. Congratulations to all. The annual Witney Rapidplay tournaments took place on Sunday 29 September at the Batt School in Witney. We ran an adult event alongside the junior event. One for next year's diary - the Witney Rapidplay has been pencilled in for SUNDAY 28 SEPTEMBER 2014, and will again be held at The Batt C of E Primary School - Mike. 25.10.13 - Match report here. 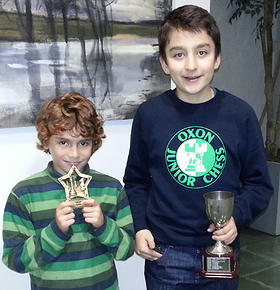 12.10.13 - For the third year in a row Witney have entered a junior team into J4NCL chess, held this year at Daventry. This time, rather than have too many players, we had just about the prerequisite number to constitute a team. Top board was Pavel, Jake and Daniel (our import from Cumnor) alternated 2nd and 3rd board, with Izzy and Marianne sharing board 4. The team was feeling confident, understandably with such talent on display. However, using the spaghetti western analogy, I have learned to expect good, bad and ugly. Game 1: Unfortunately, it did not start well. A 3-1 defeat against Manchester A was unexpected - so bad and ugly raising its head (apologies for the mixed metaphors). The only win coming from Pav. Game 2: Hackles were up after the Welsh Dragon team were heard to express, rather unfairly, that the Witney team were not very good. This had the desired effect and triggered a comprehensive 4-0 win, with Daniel finishing in a characteristically speedy fashion. Confidence was now on the up. Game 3: The third match against Midland Monarchs 3 finished impressively 3-1. After Day 1 the team was in second place. Day 2 was going to be difficult as we would start the first match with only three players. Reinforcements would follow in the form of Marianne for the final game. Therefore a management dictat was sent out to the team: win all of the matches. Surely such a Paulo DiCanio-esque instruction would be followed to the letter. Perfectly paralleling the football team counterpart it ended imperfectly. Witney ended game 4 even with wins from Jake and Daniel. Now in third place overall, our final (5th) game was against Midland Monarchs 2. Marianne arrived unflustered to join the team with 5 minutes to spare and promptly finished first winning in double quick time. A win from Pav gave us a 2.5-1.5 win to secure a comfortable third place. Well done to the team, a great fight back given a difficult start. Overall an excellent weekend of chess. Also, thanks to the long suffering parents. 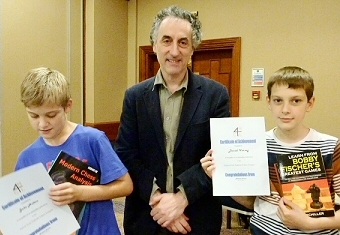 Malcolm Pein (CO of Chess in Schools and Communities) presented the third place book prizes (which was an unexpected surprise as most of the team had left by then). I must also note Malcolm was fulsome in his praise of Witney Chess Club, therefore I must pass on my praise - well done Mike. More recent news items from the current season are here.